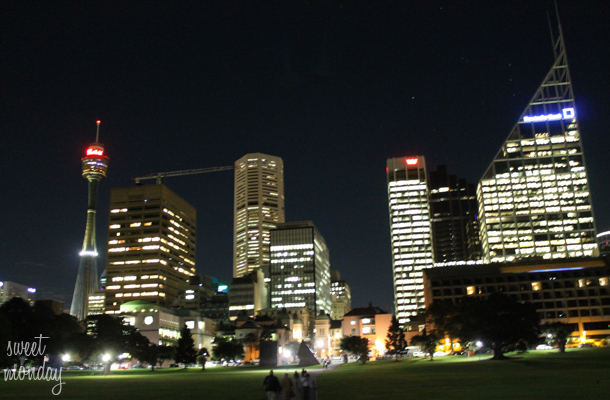 I thought I’d start the second part with a photo of Sydney’s city center lit up at night. 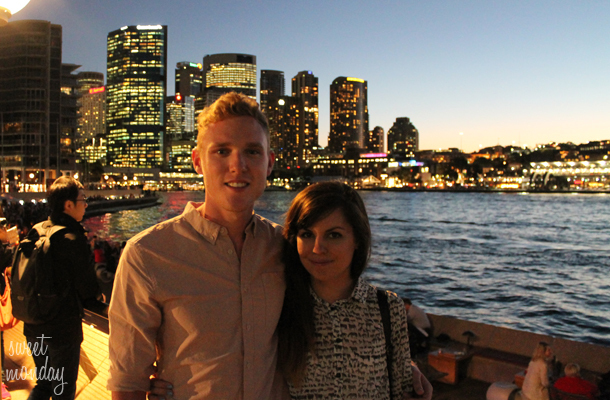 A city skyline always manages to look so beautiful at night. 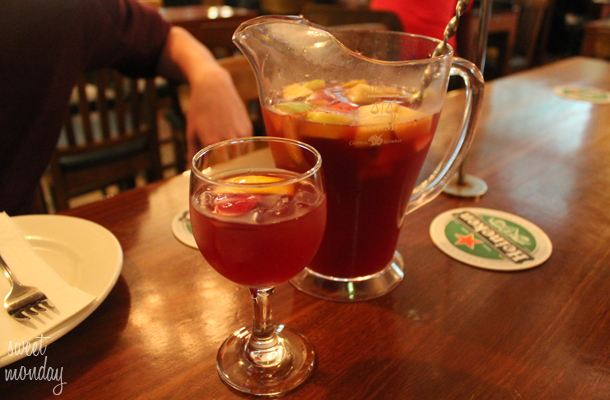 The below photos are of some rather tasty sangria and sizzling prawns we had at really cute tapas bar. I can’t for the life of me remember the name which is annoying but from the outside it looked like an old washed up bar but inside it transformed into a cave like spanish restaurant. The kitchen was quite literally in an alcove and the toilets were through a stone archway. 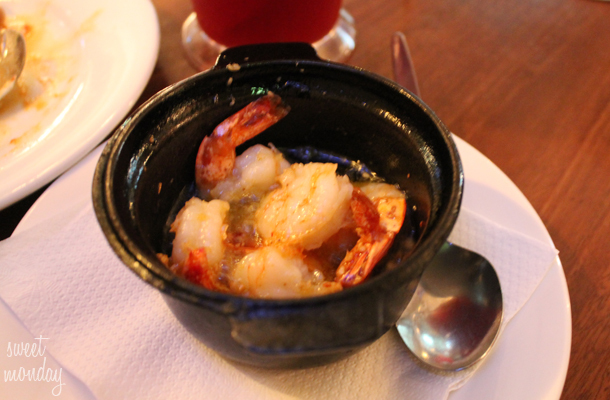 It was a really funky place. 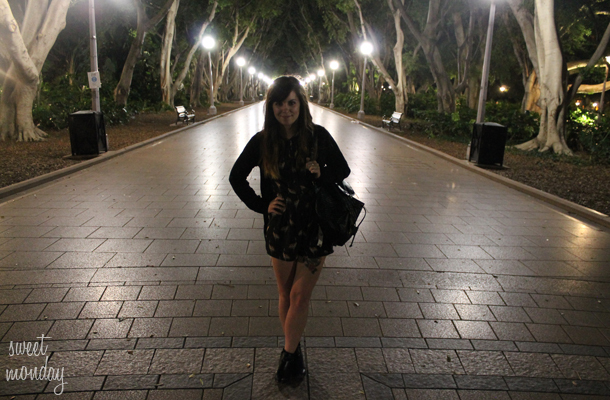 On my birthday we headed to Pancakes On The Rocks for pancakes funnily enough! 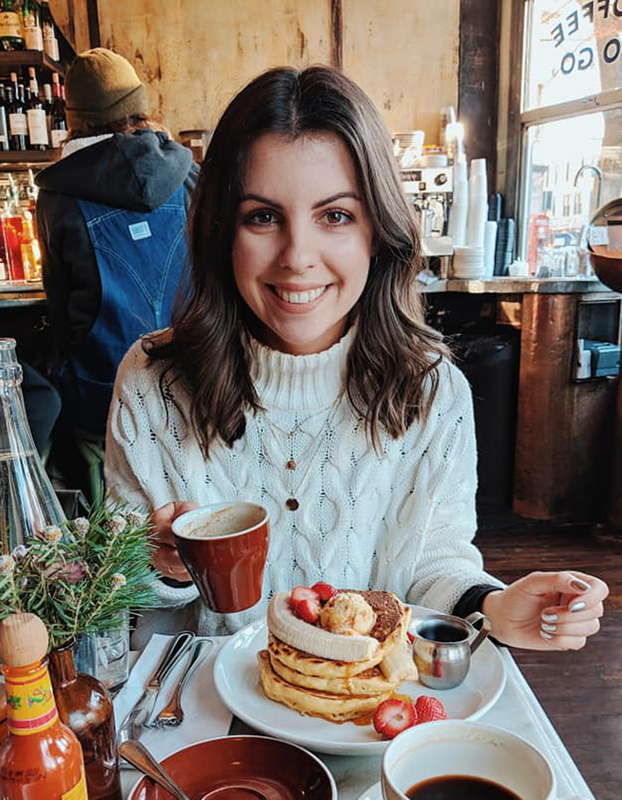 My eyes were far bigger than my belly opting for two pancakes, a fried egg, bacon, hashbrown and maple syrup and another delicious vanilla milkshake! 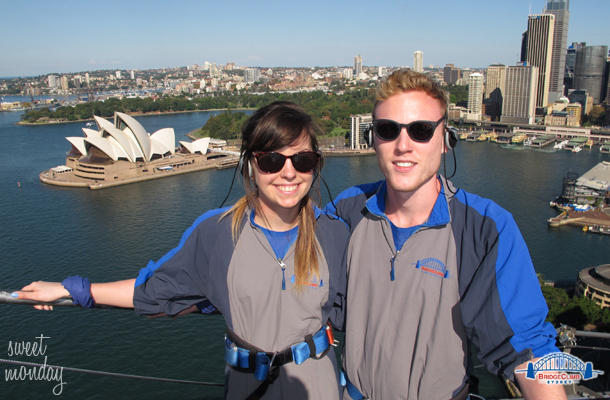 It was wise to fill ourselves as about an hour later we headed just up the street to climb the Harbour Bridge!!! 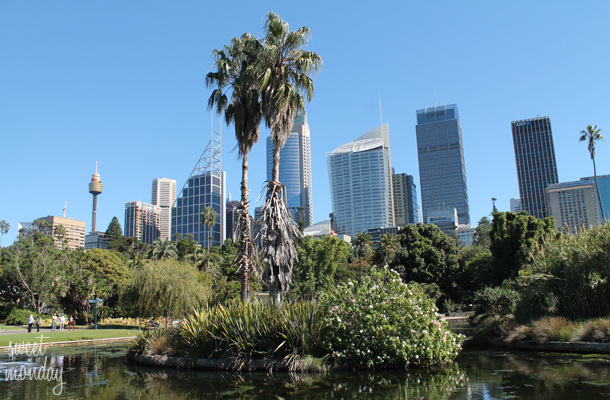 The bridge walk is pretty pricey at $218 (weekday) but it was by far worth it. 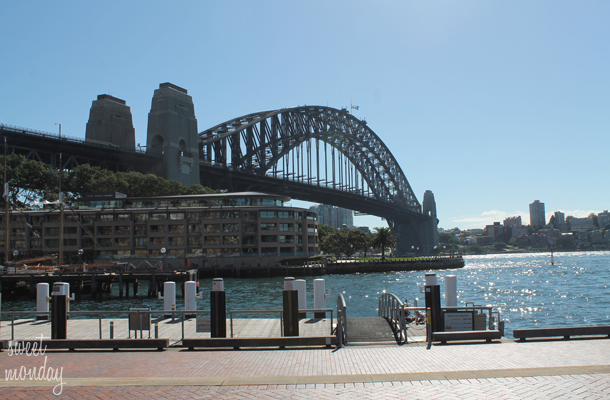 Even if you revisit Sydney you’re likely to never climb the bridge again so it was definitely a must! The whole experience takes just over 3 hours. After prepping you descend underneath the bridge from the land and once you get just past the huge stone pillars you climb upwards. I was expecting the climb to be really strenuous but in actual fact it’s really easy. You climb up 4 ladders from underneath the bridge to get above it and then once on the arch the steps are shallow and deep. You climb to the halfway point on the bridge, stopping for lots of photos and the guide fills you in on everything you can see, before heading across the middle onto the other side and back down again. Because it was my birthday they all sang happy birthday to me at the top which is something I will never forget!! Check out our cheesy mugs below. The next day we finally stopped at a restaurant near our hotel which went on to become our favourite place to eat of the whole trip. 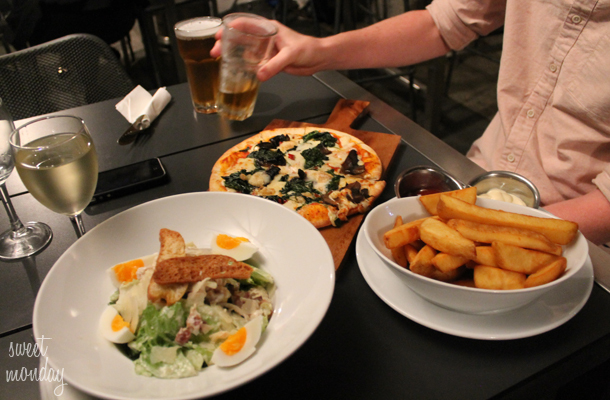 It’s called La Buvette and is situated in Potts Point. 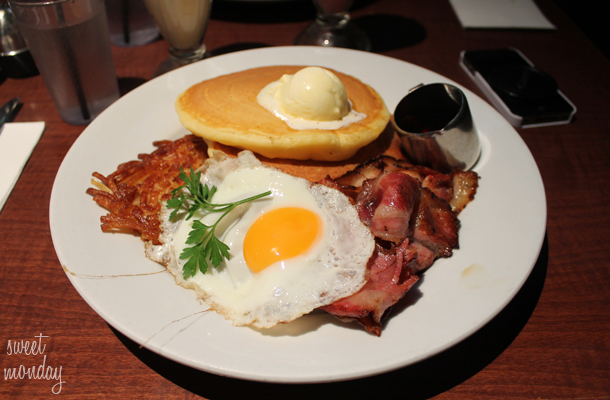 They have an extensive breakfast menu (as well as lunch and dinner) and it never failed to disappoint. 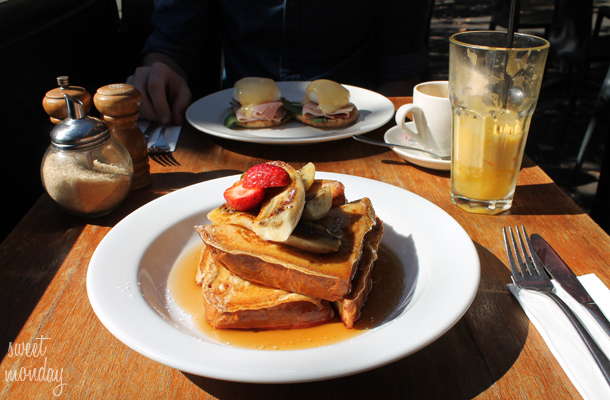 On this occasion I went for french toast with grilled banana and Stew opted for eggs benedict. For this kind of breakfast plus a large smoothie we payed around $20 each which is about £14 so it’s not cheap but nothing in Sydney is! 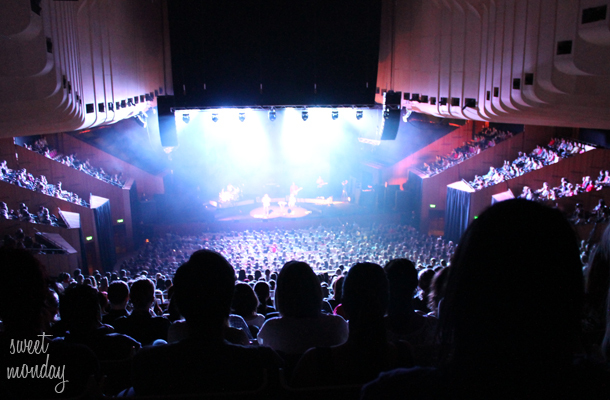 One evening we were lucky enough to over here a lady talking about going to the Opera House to see a Tegan & Sara. We weren’t huge fans but thought it would be pretty cool to watch a concert there so we looked into it and sure enough there were tickets left. It cost us about £40 each and considering it costs £35 for a tour around the Opera House anyway we thought this was a bargain! It was such an amazing experience, the acoustics were like nothing I’d ever heard at a concert before and Tegan & Sara were really good. 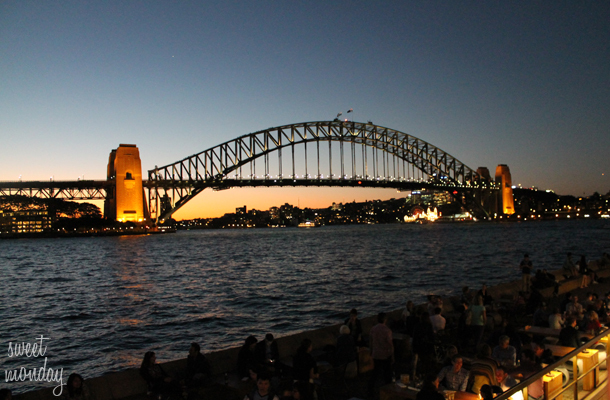 Before the concert began we enjoyed the breathtaking views of the Harbour Bridge lit up at night and ate at a nearby bar called Searock. They have a $5 happy hour between 5-7pm too. Considering the incredible view we couldn’t believe that the entire meal only cost us around $30 each.